Plant Bulbs with Wildflowers this Fall for Year Round Blooms Next Year. It's every gardener's dream - a yard that blooms from spring through fall with an ever-changing blaze of color. The good news is that you can achieve this landscape with less work than you might think by planting bulbs and wildflowers this fall. When the spring thaw rolls around, you can sit back and enjoy the colorful show in your yard. "If gardeners are going to be planting fall bulbs, it just makes sense to make the most of your time and effort and plant wildflower seeds at the same time," says Ray Allen of American Meadows. The Williston, Vt.-based company, celebrating its 25th anniversary, is well-known among gardeners as a great source for high-quality bulbs and seeds, and, as the founders of The Vermont Wildflower Farm, a popular tourist attraction. Since fall planting of wildflowers is recommended for every part of the country, doubling up on your planting strategy is an easy way to increase your payoff in the spring. "'More beauty with less work,' is our motto," says Allen. He points out that October is the one month when all 50 states enter a time recommended for wildflower seed plantings. Californians can start planting for their early spring, while a killing frost has hit most of the rest of the country, making it the best time to fall plant in northern states. "Most people are in the habit of planting wildflower seeds in spring, since that's the time most people are renewing their yards," says Allen. "But fall is better." Not only are wildflowers and bulbs a good planting combination, but they are good growing companions as well. While bulbs provide the first signs of spring and early color in the garden, wildflowers follow a bit later in the season, about the time that the tops of daffodils and tulips are dying down. That means time-pressed gardeners can get away without trimming the dying bulb foliage - it will be obscured by the lively wildflowers. The wildflower and bulb combination works equally well for smaller areas like borders and for an entire meadow of an acre or more. Gardeners who plan to plant fall bulbs will want to take advantage of American Meadows' fall bulb sale, going on now. Choose from well-known bulbs like daffodils and tulips, or go for something more exotic like Camassia, a hard-to-find native bulb. In addition to daffodils (which are deer resistant), gardeners will find a variety of other naturalizing bulbs, such as Spanish Bluebells, Species Crocus, Species Iris, Grape Hyacinths and Wild Tulip. 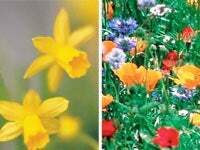 The company also offers a great range of wildflower seed mixtures. 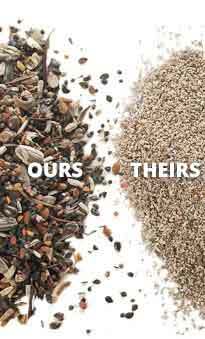 Gardeners can choose a mix created specifically for the region of the country where they live, or opt for mixtures for special uses, such a the wildlife mix, the butterfly and hummingbird mix, or mixes designed for problems areas, such as dry or shady parts of the yard. Gardeners who plant naturalizing bulbs along with American Meadows' regional wildflower mixes, which include annual and perennial wildflowers, can look forward to years of enjoyment. For gardeners looking for a one-summer show, any bulb plus the company's All Annual Mix will keep the yard in full bloom right up until frost. And here's a "gardener's secret" you can share or keep to yourself -- fall planted seed blooms earlier than spring-planted seed. "We've planted every fall and spring for years, and our fall seedings of the same mixes are always in full bloom about three weeks earlier than the spring beds without fail," says Allen. American Meadows' Web site is also a treasure trove of planting and growing information for gardeners, whether you're an experienced pro or just breaking in your green thumb. The site can guide you through the process of planting from start to finish, as well as provide expert advice and suggestions on what to plant. Visit the "bulb how-to" section of the Web site for a step-by-step bulb planting guide and the "planting instructions" section for instructions on how to create a wildflower meadow. To shop American Meadows' fall bulb sale, visit www.americanmeadows.com.